For some people, giving their pet a pill is an easy task. However, this is the exception---NOT the rule. 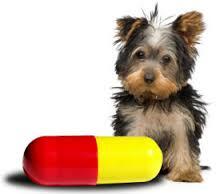 In most instances, giving pets supplements or medication does require some effort. Many people struggle with the issue that if their pet doesn't want to take something, then they don't want to force it. We love our pets and don't want to "upset" them. That is why it is so important that you, as their caretaker, feel good about what you are administering so that you can take charge and make the process as simple as possible. "Hide" the pill in food-Try to convince your pet "it's not a pill, it's a treat". You can hide the pill in a special food or treat that you ONLY use at pill time. Try some premium canned pet food, mashed potatoes, baby food or a natural pill pop. Do NOT use peanut butter, cookie dough or full fat cream cheese or other cheese. Many pets are allergic to the ingredients in all of these and they are too high in fat. Most pills can be crushed or opened, mixed with water and given in a syringe. This technique works very well, especially with cats. Open the capsule of the supplement (check with your veterinarian if this is ok with any medications as some are time-release and cannot be administered this way) or crush the pill, mix with water and syringe into your pet's mouth. Syringes can be purchased at any drug store or at your veterinarian's office. If all else fails and your pet spits out the pill, then you will need to open your pet's mouth, place the pill quickly into the back of the mouth, close the mouth and then gently massage the throat to ensure the pill is swallowed (while holding the jaws shut). This is a lot easier than it sounds and sometimes may be your only option. Your veterinarian's office can show you how. When it comes to giving pills, understanding the benefits of what you are administering will keep you going as, in many cases, giving an uncooperative pet pills takes time, effort and can be stressful. This isn't always easy but if you believe in what you are doing, then your pet will come around. They sense your ambivalence and some can be quite stubborn. But when you are confident you are doing the best for your pet, compliance with pills in the end, comes down to taking charge and letting your pet know (through your body language) that you love them and are trying to help them.